Paula Abdult is a former Laker cheerleader and professional singer. She recently judged the hit TV show American Idol. She has starred in such films as Touched by Evil, The Waiting Game and Mr. Rock 'n' Roll: The Alan Freed Story. Paula Abdul of American Idol fame wearing a dress that is split down the middle showing off a lot of cleavage as she talks with Star Jones from the 2005 Emmy Preshow. Paula Abdul wearing a white dress with her breasts pushed up showing off some impressive cleavage as she talks with some guys from American Idol. Paula Abdul of American Idol fame wearing a low cut black dress with her breasts pushed up showing off some impressive cleavage as she talks with some people in an art gallery before Andrea Parker and another guy come down some stairs and talk to her some more from Less Than Perfect. Paula Abdul of American Idol fame showing some nice cleavage as she presents along with some other people at the 2002 MTV Video Music Awards. Paula Abdul of American Idol fame showing some slight cleavage while wearing an orange dress and a black bra as she presents at the 2004 Teen Choice Awards. 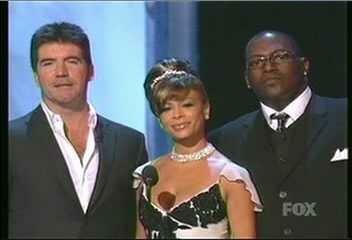 Paula Abdul showing some nice cleavage in a tight black dress while standing at a microphone and presenting an award. From the 2003 American Music Awards. Paula Abdul of American Idol fame wearing a white dress that shows off some nice cleavage as she presents at the 2003 Emmy Awards. Paula Abdul of American Idol fame showing some nice cleavage as she turns around in slow motion during the Countdown to the Emmys.